Wow. That's all I can say about the crazy amount of rain we have received in the Austin area in the last few weeks. Downtown Austin was even under water at certain points. Yesterday we had 3, yes 3, different tornado warnings in our small town. Luckily, nothing came from them but wow. Just wow. The pic from the listing. A pic from when we actually moved in and my baby brother came over to help demo all of that tile. I actually didn't mind the dark look - for a bit. Then it got to where it was too dark. And those Ikea table, chairs and curtains? They didn't last very long either. Along the way, I decided I wanted bling. I fell in love with a light and ordered it online. The problem (and I've never admitted this) was that it wasn't what I wanted. It looked so much different online. In person, the "crystals" were just plastic pieces and it looked cheap (although it retailed for $600). But I kept it and tried to make it work. Next, I moved on to the brown stage. I'm not sure what I was thinking there because I don't like brown. I started by picking up a table from Nadeau. It was more of a farmhouse style and the only thing I've kept. I also bought a few chairs from Restoration Hardware. I wanted them so badly, but they were just too small for the size of the table. I picked up some drapes from Pottery Barn and a rug from Home Goods and it looked like this for a bit. I hated it. As you can tell, I had started to use the table for other things (like a place to paint the cabinet doors). And the wall color? It was the Slate I used in the entry way (yet it ended up so much more brown upstairs). So dark. Eventually, I found the wall color I would keep - Light French Gray from Sherwin Williams. I began by taking down those curtains and painting the room. Next, I decided to add trim because all of you know that I LOVE TRIM! For the crown, I used four pieces of trim, creating a unique design. I purposely took a pic of the rough design so you could see the layers (although the top pic is from my bathroom, I used the same trim in the dining room). After the crown, I added window casing. The casing was two pieces of trim. A standard casing trim and then a piece of lattice around the edges. I even decided to build up the baseboards. Again, just a standard baseboard with a base cap piece on top. After all of the trim work, I replaced the chandelier with something that fit the house better (the Rhys chandelier that I scored from Lamps Plus on sale for only $125!!!) and then added window grids and mirror. You can see the window grid tutorial here and the mirror tutorial here. So, once the actual room was finished (painted, trimmed and good to go), I started working on the pieces of the room. 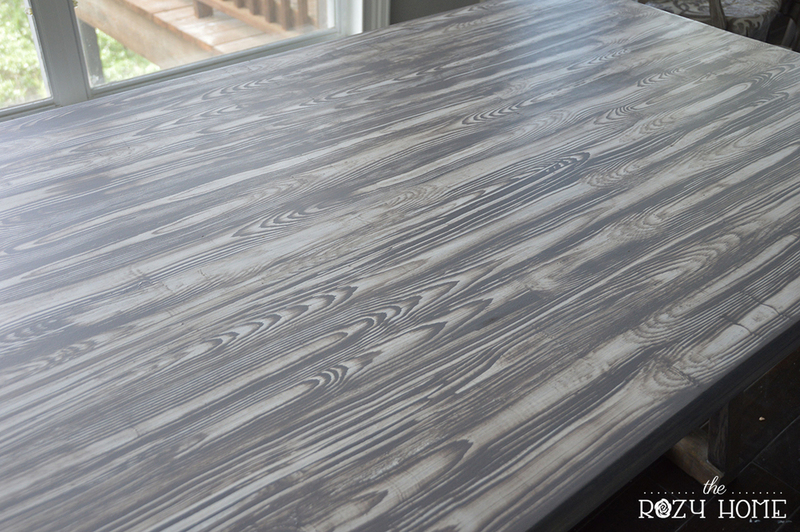 Since the table had been used and abused, I stripped it down and added a faux wood grain to it. You can see that tutorial here. I also gave some consignment store cane back chairs a French farmhouse makeover. You can see that tutorial here. Oh! And I almost forgot about the dining bench I made here. All that was left now was decorating! Truth-be-told, I struggle badly with decorating. The thing I had going for me in the dining room, was that I had a basic idea of what I wanted. So, I grabbed a few things from around the house, picked up a few things from Pottery Barn and wrapped the room! For the table dressings, I purchased galvanized metal chargers from Pottery Barn and layered them with my Petrol Sabre Numero 1 dinnerware (that I adore). I used the Emma Embroidered Dot Napkins from Pottery Barn held with the Maxfield Napkin Rings. The runner is also Pottery Barn (the Winnie Runner) and had the perfect blues for my space! Total cost for these items (not including the dinnerware, which I already had) was around $160. At some point I want to get artsy and paint the edges of the metal chargers, but for now - they are great. Side note: For those of you who have kids, these chargers are amazing! I've used placemats for years and would you believe these are much easier to clean? Since the kid's plates sit inside the charger, all of the crumbs that normally land on the floor or the table end up on the charger. The best $50 I could have spent in the dining room! If you look to the top right of the image, you will see my kids wall. This is my favorite part of the space. We have our favorite pics and projects from over the years up there. Since I sit on the far right, I get to look at it every time we eat dinner. And I love it!!! The kids actually asked for a bench so it was done before I even knew what I wanted to do with the table and chairs (this is the same bench that caused the "toe incident". And yes, I have an irrational fear of moving it). The square vases were actually centerpieces from our wedding. Also, you will almost always find hydrangeas on my dining room table. They are my absolute faves! The rug was the last thing added and is one of my favorite pieces. I found it at Home Goods for only $129! It is a 5' x 7' jute rug with a herringbone pattern - perfect for under a dining table in a home with kids! Ideally, I would be able to miraculously find a 5' x 9' rug, but they don't seem to exist (we tried 6' rugs in the space, and they ended up bumping up against the baseboard and I just didn't like that at all! This room was hard for me because there were no real walls to decorate. What I did have, though, is an amazing view courtesy of Mother Nature. I struggled to bring design into the room without taking away from the view. For those who are super observant, you may have noticed that the window grids changed from the first pic to the last. I actually redid them so that they covered less of the windows (and therefore didn't take away from the view). I also used a slightly thinner wood so I could easily open and close the windows. I worked hard to create an open and airy space that didn't distract from the beauty all around it. I also worked to make sure the room worked with the kitchen since this is basically a really huge eat-in kitchen area (more so than an actual dining room). Every detail down to the stain on the table (which is very close to the island countertops but not exact), the blue in the table runner (which matches both the blue of the island and the interior of the glass cabinets) to the herringbone rug that plays off of the herringbone counters, was done to ensure this was a cohesive space. I love how light and bright the room has become. And for those who are wondering, if you look at the very top of the trim on the window to the left, you will see the bottom of a window shade. The back of our home faces west - giving us some of the most amazing sunsets - but during the summer, it is a sauna. Since I'm not a fan of drapes, I opted to use a cellular shade. Of course, I don't like the way they look, so when installing the trim, I dropped it down a couple of inches which concealed about 95% of the shade when it is up. Pretty cleaver, huh? So that's it. I can now check off three rooms in our home that are completely finished. Woo hoo!